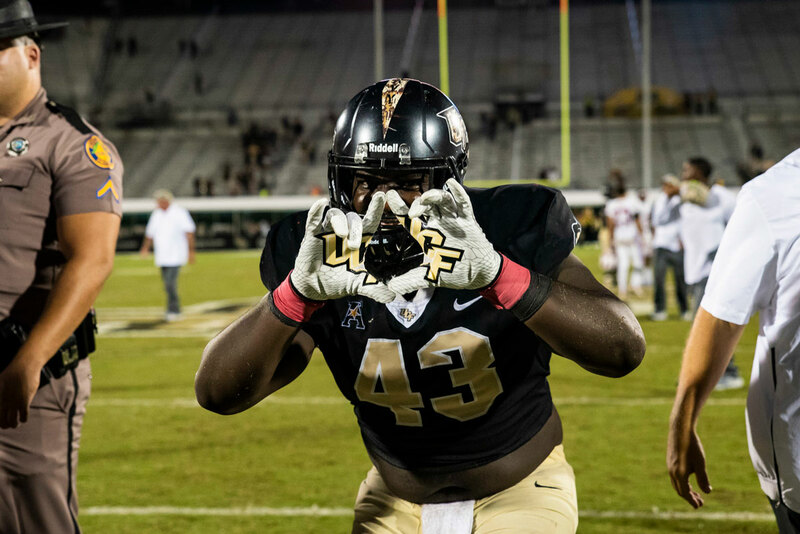 1UCF improved to 5-0 this season and is one of 11 teams around the country who are still undefeated. Fellow American Athletic Conference members Cincinnati and USF are also perfect so far. 2Knugget is a new addition to the March to Victory this season and is quickly becoming a fan favorite. 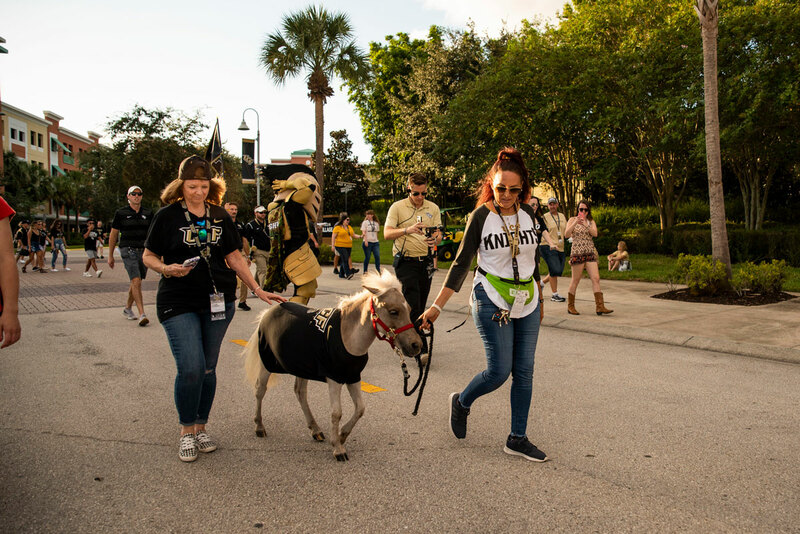 The mini horse has his own Twitter account, @UCF_Knugget. 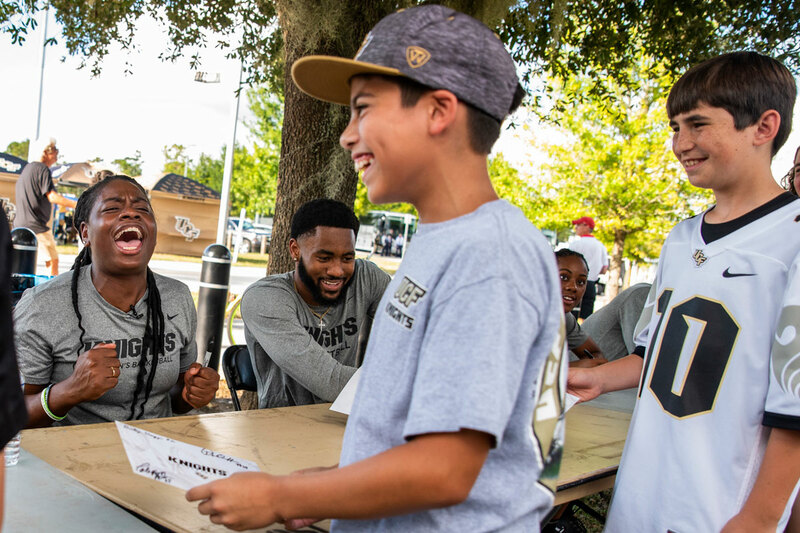 3UCF's men's and women's basketball teams signed autographs for fans outside the stadium prior to the game. The squads will play in their season openers next month. 4Prior to the game, Splash Dogs entertained fans with their acrobatic skills. 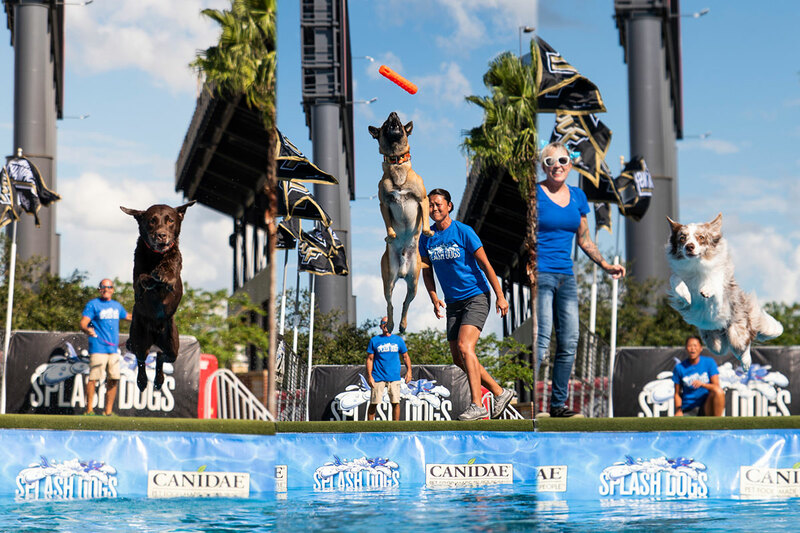 Splash Dogs strives to provide a family oriented competitive atmosphere as dogs of all different breeds fling themselves off a dock in pursuit of catching toys midair before splashing down into a pool. 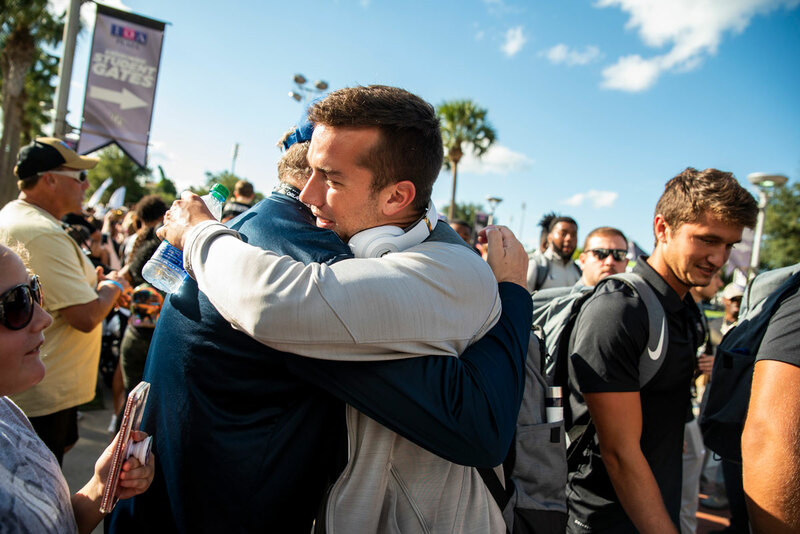 5UCF quarterback McKenzie Milton greets a fan on his way into Spectrum Stadium. 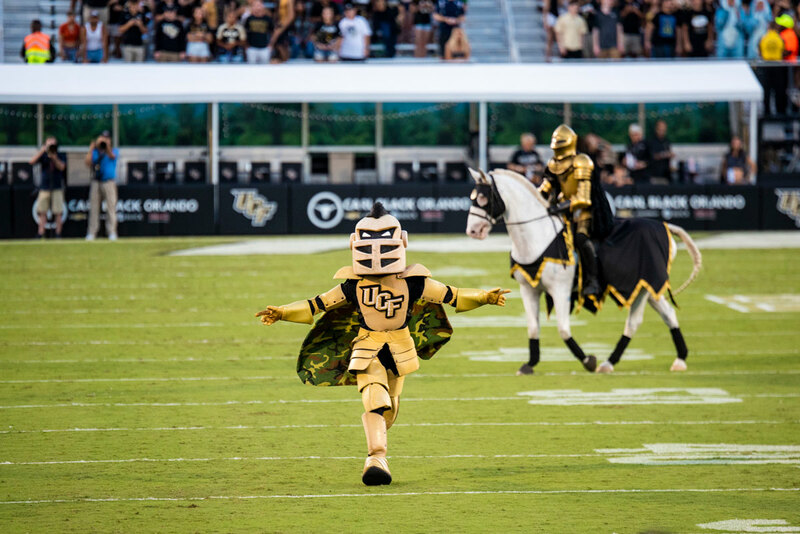 6Knightro and Pegasus charge on to the field before kick off. 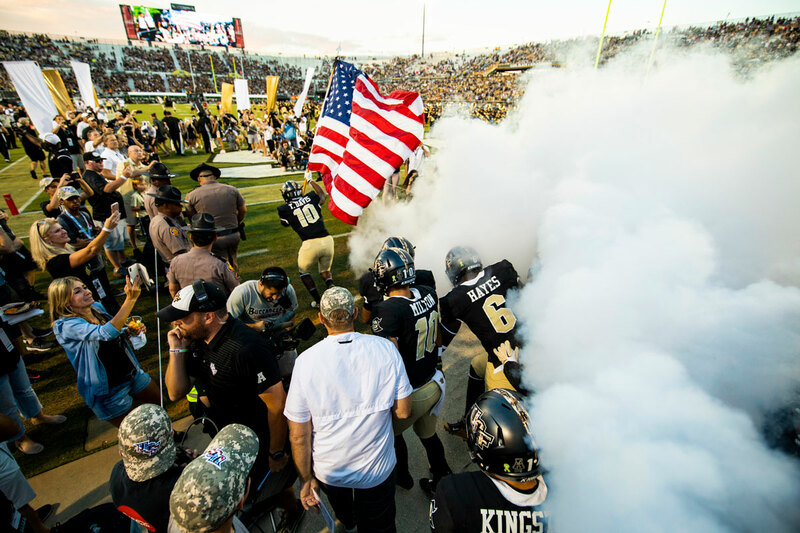 7UCF held its annual Military Appreciation game, and the Marching Knights put on a special halftime performance to recognize and thank the different branches for their service. 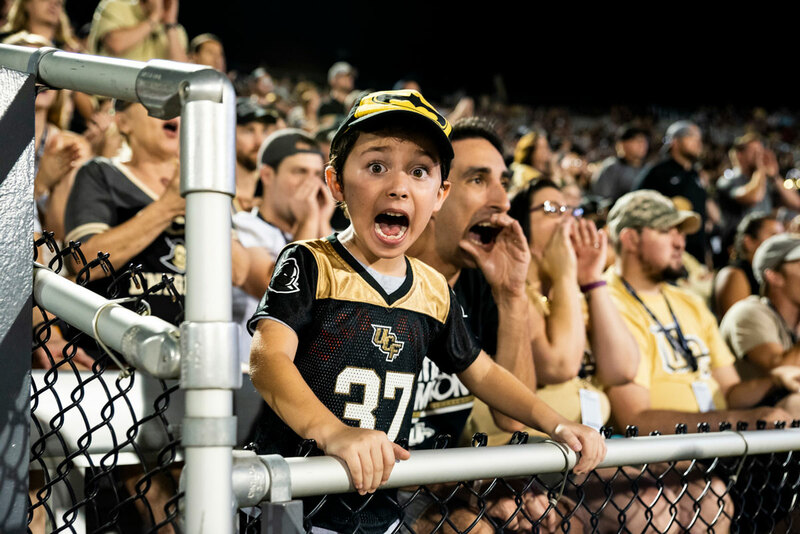 8Spectrum Stadium was packed with nearly 41,000 fans who cheered on UCF to the win. 9Wide receiver Tre Nixon was one of six Knights who scored in the game. 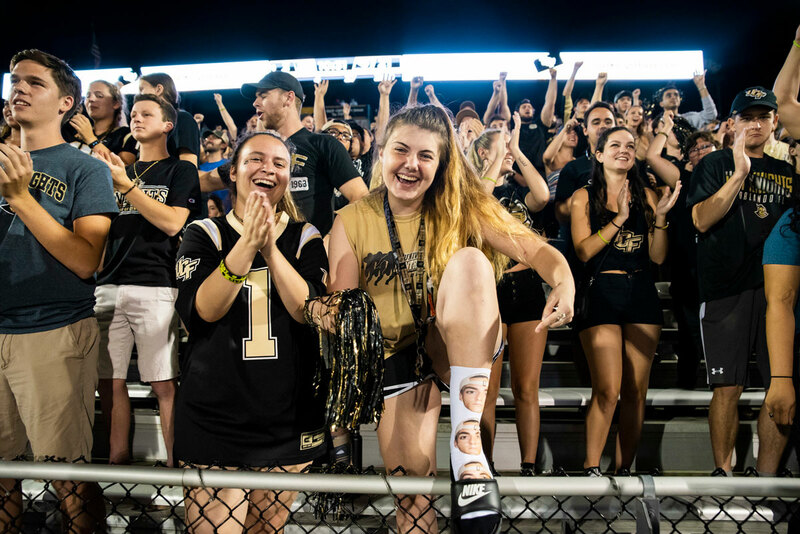 10A fan shows off her limited edition Rock 'Em Apparel socks featuring UCF's "stare-down kid." 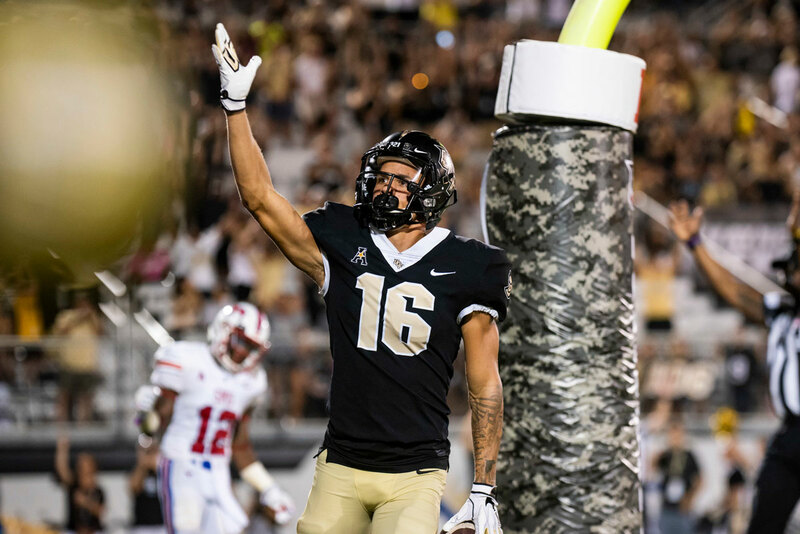 11Following the win, UCF rose to No. 9 in the country in the Amway Coaches Poll. 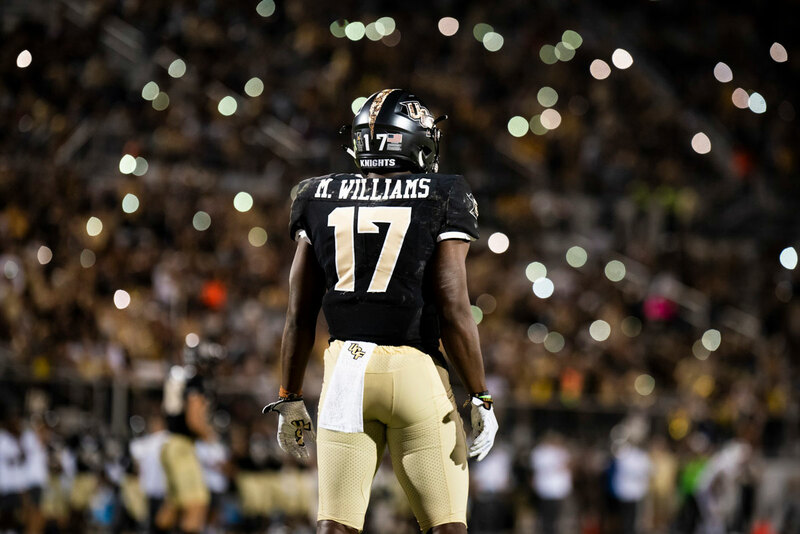 At this point last season, UCF was ranked 21st and 22nd in the AP Poll and the Coaches Poll, respectively. 12The Knights also climbed two spots in the AP Poll, rising to 10th in the nation. 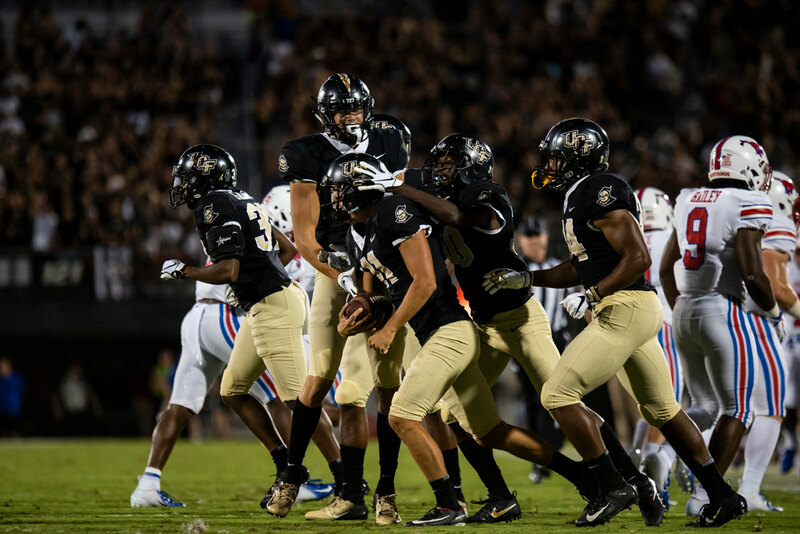 It marks the third time in the last six seasons that UCF has ranked in the Top 10, also having done so in 2017 and 2013. 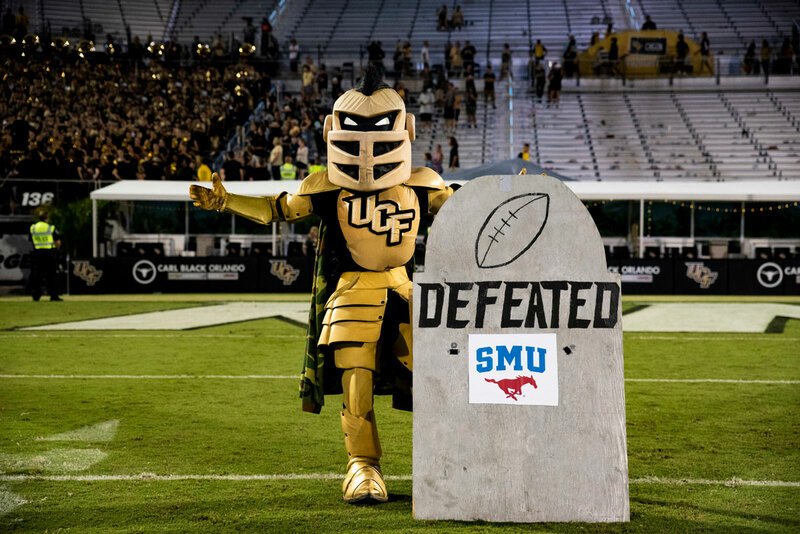 13Thanks to Saturday's win, UCF now leads the all-time series against SMU, 8-1.